Figure 2.15. 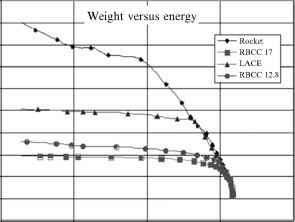 Adding the weight history shows the differentiation of the propulsion systems in terms of initial (lift-off) weight and the convergence to a single on-orbit value. airbreathing speed to Mach 17 from Mach 12 has much less impact than moving from Mach 6 to 12. What the propulsion system directly affects is the oxidizer to fuel ratio at the beginning of the flight when the thrust required is the greatest and a reduction in the oxidizer-to-fuel ratio has the greatest effect, as shown by the liftoff weights on the left-hand ordinate. As developed in this chapter, systems studies with what appear to be rational assumptions, such as turbojet low-speed propulsion or a combination of engines, doom the airbreathing launcher from its inception. A combined cycle propulsion system in which a single propulsion system can transition from one mode to another is the key to the success of the airbreathing launcher. As Figure 1.1 implies there continued an effort to design and build an aircraft-like hypersonic vehicle that could fly to space [HyFac, 1970; Lockheed Horizons, 1966]. However as many valid programs that were initiated, there were as many programs seeking to discredit the airbreathing vehicle effort. Figures 2.16 and 2.17 show one such example of the conflict as presented in a briefing in the 1970s. The three aircraft shown in Figure 2.16 are, from top to bottom, an all-rocket single-stage-to-orbit (SSTO) launcher, a Boeing B-747-100, and an airbreather/rocket SSTO powered by a combination of 35 turbojet, ramjet, scramjet and rocket engines. So at any one time, three-fourths of the installed propulsion system was being carried as dead weight. As correctly depicted it is a very large airbreathing/rocket SSTO because of the inert weight carried in the non-operating engines. The turbojet is a very poor acceleration propulsion system and can consume more fuel than a rocket in some flight regimes. To many, this was a legitimate comparison considering the low launch rate of rocket launchers, the non-existence of a viable civil need to increase the launch rate, and, for the rocket advocate, the absence of a good reason to replace the rocket. Figure 2.16. The rocket advocate's vision of launchers that fly regularly to space. The allrocket SSTO launcher (top) is smaller but heavier than the B-747 (center). The airbreather launcher powered by a combination of 35 engines of four different types is larger and heavier than the B-747, discouraging the airbreather concept. Figure 2.17. A balanced vision of launchers that fly regularly to space. The all-rocket SSTO launcher (top) is smaller than the B-747 (center). The airbreather launcher powered by a combined cycle ejector ram-scramjet is smaller and lighter than both, but is never pursued as a launcher or hypersonic cruiser. Figure 2.18. Airbreather/rocket, single-stage-to-orbit configuration (left) and a rocket-derived hypersonic glider, single-stage-to-orbit configuration (right). one and only one propulsion system operating. The result is a vehicle with slightly less volume and empty weight than the all-rocket and about one-third the gross weight. The airframe and propulsion system were designed for at least 100 flights before overhaul. At the flight rate anticipated in 1968 that was sufficient for 8 to 10 years' operation with inspection and maintenance as now accomplished on commercial aircraft. The perception was that the simpler and increasingly reliable rocket was the least costly for the low launch rate required at the time. The launch rate could not be increased because of the selection of the rocket launcher as the primary space launcher system and the payloads that required a high launch rate never appeared, justifying the selection. So the expendable rocket launchers prevailed, and none of the expectations of the hypersonic engine and aircraft of the late 1950s and early 1960s were ever realized. Historically, much of the work done on these vehicles was for highly classified military programs with very limited access and is now lost or shredded. References (such as [Stephens, 1965; McAIR, 1966a,b; Lockheed, 1967]) are the program references that document a small portion of what was accomplished. The other great debate was single-stage-to-orbit versus two-stage-to-orbit. Both have advantages and disadvantages depending on operational concept and geographical location. It is the operational requirements that make the decision. For the support of an orbital station, as discussed in Chapter 3, with a very specific payload requirement and specific launch sites to a given orbital inclination and altitude, then a SSTO makes a good minimum operational equipment choice. If the operational mission is to deliver both crew and crew supplies in addition to large orbital payloads from different launch sites for different orbital inclinations and altitudes then the TSTO offers a wider range of versatility. 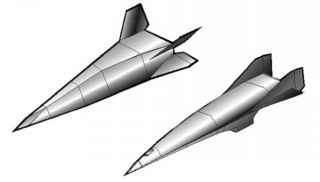 Figure 2.18 shows two SSTO configurations based on an airbreathing-rocket propulsion system and a hypersonic glider based on a rocket propulsion system. Nominally these are in the 7 to 10 metric ton internal payload class. Chapter 3 provides a discussion of the rocket propulsion hypersonic glider that was proposed in 1964 to support the Manned Orbiting Laboratory with a 7-ton crew or supplies payload. Except for the configuration, the concept was analogous to the Russian Soyuz-Progress capsule. Figure 2.19. Airbreather/rocket, two-stage-to-orbit configuration with all-rocket second stage (left) and an all-rocket hypersonic glider, two-stage-to-orbit configuration with all-rocket second stage (right). Although many concepts were analyzed and designed, these concepts were not able to displace an expendable rocket for any mission role. For operational mission that deliver both crew and crew supplies in addition to large orbital payloads from different launch sites for different orbital inclinations and altitudes then the TSTO offers a wide range of versatility. As shown Figure 2.19, there are two TSTO concepts. As shown, these have rocket-powered hypersonic gliders for second stages. Just as is shown for Energia in Figure 2.10, a faired payload canister can be substituted for the hypersonic glider. If the nominal payload of the second stage returnable hypersonic glider is 7 metric tons, then the payload for the expendable canister second stage could be as large as 23 metric tons or a space station component approaching 28 metric tons. So the payload capability to orbit spans a four-to-one range. With the flying capability of an airbreathing propulsion first stage, considerable offset is available to reach different latitude than the launch site or to expand the launch window by flying either east or west to intercept the orbital launch plane. With this versatility to provide launch capability to different worldwide sites, the TSTO makes an excellent choice for a commercial space launcher. Note that the upper stage can have either a pointed nose or the spatular two-dimensional nose. The latter reduces the nose shock wave drag by as much as 40% [Pike, 1977]. Pike began his work on minimum drag bodies in the mid-1960s. The spatular nose can be used on almost any hypersonic configuration whether SSTO or TSTO, first stage or second stage. Even though some excellent designs were originated in Germany, France, Russia, and the United States based on available hardware with very capable performance to LEO, none were ever able to displace the expendable rocket. The launchers remained as they began, as ballistic missiles. Figure 2.20. Large aircraft-based two-stage-to-orbit configuration with a combined cycle powered waverider second stage. metric tons. 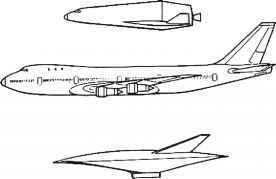 In this case the fuselage of the An-225 can carry a portion of the launch crew and equipment. A second An-225 has sufficient volume to carry the liquid hydrogen required for the space launcher. In this case the An-225 is more of a mobile launch platform than a first stage. With the range of the An-225, and the low-noise operation of the six turbofans that power it, the An-225 can make almost any commercial international airport a launch site. In Figure 2.20 the An-225 is shown with a combined cycle ram-scramjet-powered waverider mounted on top. The payload capability of the launcher is 7 metric tons. This particular approach has the An-225 operating on hydrogen fuel, and is equipped with an air collection and enrichment system in the cargo hold. That is, the hydrogen that is used to power the engines liquefies air and then separates the oxygen and nitrogen. The oxygen is liquefied and pumped into the launcher oxidizer tank (the launcher has no liquid oxygen in its oxidizer tank at takeoff, only the liquid hydrogen tank is filled). This means that the two aircraft are heaviest not on takeoff but near the launcher separation point [Czysz and Little, 1993]. A LACE, deeply cooled airbreathing rocket, or the original HOTOL airbreathing rocket (Rolls Royce-593) would have provided a successful solution (see Chapter 4). 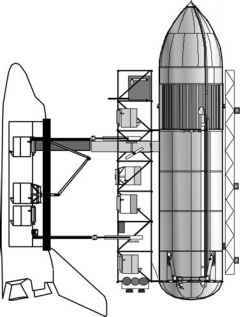 The use of the AN-225 as a mobile launch platform was a very practical commercialization concept for both space tourism (Mach 4 and 100 km altitude) and for a commercial point-to-point cargo delivery system (12,000 nautical miles in 90 minutes) as it eliminates noisy rocket launchers, provides an independent heading and altitude launch, and makes any commercial airport a potential launch point. This concept brings the launcher to the customer for a worldwide launch service for any country wishing to put a payload into orbit, send cargo to another point on Earth, or launch citizens on a tourist flight from their own country, not a foreign site.